Costa Rican coffee is certainly among the worlds finest. Our favorite comes from the Doka Estate, set at 4500 feet against the backdrop of the majestic Volcan Poas, the largest volcanic crater in the world. This award winning coffee is smooth, rich, and flavorful and makes a superb breakfast brew. 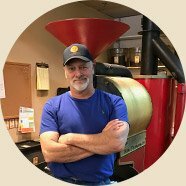 WHAT OUR GREEN COFFEE IMPORTER SAYS! Costa Rican coffees set the standard for washed (wet processed) bright Central American coffees in both the bean and at the mill. They are exceptionally high grown in amazing volcanic soil. These two factors come together to produce a very bright and very clean cup. The best Costas are the cups that develop a bit of berry fruitiness to compliment the straight-out brightness. These coffees serve as an excellent bright single origin coffee and will definitely add life to various blends. Additionally, these slower grown, dense, high altitude beans can take the heat of a French roast. The many different regions of Costa Rica produced coffees with subtle, but distinct, differences in the cup. 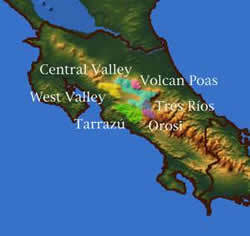 Tarrazu is the marquis region of Costa Rica noted for the best soils and highest altitudes. While no single country, or region can guarantee an exact level of coffee year in and year out, as coffee is subject to wind, rain, sun, and other sometimes-less-than-cooperating forces of nature, coffees from Tarrazu do consistently stand out for their brightness and clean cups, with hints of light berry and apple cider. Volcan Poas, besides having one of the cooler-sounding coffee region names, produces some very fine coffee with a bit more fruit than its southern neighbor of Tarrazu. A bit of smoky volcanic soil taste comes through to the bean too, in certain special coffees. Tres Rios in the cup is a bit softer and a bit more balanced than the straight-on, take-no-prisoners brightness of some of the other regions in Costa Rica. 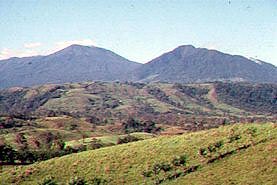 Coffees from this region are a great single origin cup, or introduction to Costa Rican coffees. Another amazing feature of Costa Rican coffees is the human touch at the beneficios (mills.) where the processing and milling of coffee approaches a level of artistry not easily surpassed. Besides immaculately clean mills, which are the standard, the efficiency and beauty of the inner workings of the mill amaze. For example, with strict Costa Rican environmental laws, wastewater from the fermentation tanks is treated with natural bacteria to break down the acidity reducing the pH back to levels that are tolerable for the streams and rivers of the country. By using the wood from pruned old coffee trees, along with the parchment from dry milling, many mills do not use a single stick of outside wood to fire the mechanical dryers. Some of the more inventive mills actually use the methane gasses produced when the bacteria breaks down the fermented pulp to fire the dryers. Finally, sun-dried coffees, of course, are just simple "solar" powered. All in all, the mills are an impressive sight, from the small single estate to the largest cooperatives. Introduced: Brought from Cuba in 1779. Became major agricultural actitivty in 1808.